Emma takes ballet lessons. So does Julia. Emma is learning to be a ballerina. Julia is a professional ballerina. They are both excited about the big performance in the theater tonight. Emma will be watching from the audience. Julia will be dancing onstage! And afterward, Emma will go backstage to meet her ballet hero! Barbara McClintock's richly illustrated, heartwarming story is sure to become a perennial favorite. Barbara McClintock tells the beautiful story of two ballerinas from different worlds, but with a shared love of the stage. Emma is a young girl who dreams of being a ballerina. Julia is a young woman who is getting ready for a big performance. Each page juxtaposes Emma and Julia's day to day. By putting them side by side, the reader can see that despite their age and background differences, Emma and Julia have a huge thing in common. Emma shares the same dedication to dance as Julia does. They both wake up early. They both have balanced meals. They both go to dance practice. Everything they do leads them to the same evening performance. Emma, a budding ballerina, gets to see Julia on the big stage. It is a heartwarming finale that brings two worlds together. McClintock's illustrations are filled with warm and soft colors, and the movement of the dancers jumps off the page. 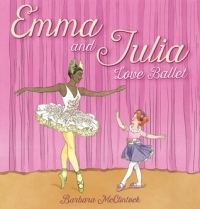 EMMA AND JULIA LOVE BALLET is perfect for kids who love ballet and dance, as well as fans of Misty Copeland. Emma and Julia are truly inspiring.